We have a new YouTube channel: Le Fay Tiefenrausch! Have a look. We are very pleased to announce we’ve bought new suits. Our parents taught us that you have to be well dressed at award ceremonies. So we thought, if we’re going to receive the German Musical Instrument Award 2017, a grey suit with a black shirt would probably look quite good at the award-giving ceremony. We’re curious to find out how our dear friend and colleague Gerald Marleaux will deal with the issue of what to wear, because he too will be receiving this award. We sincerely congratulate him on that. 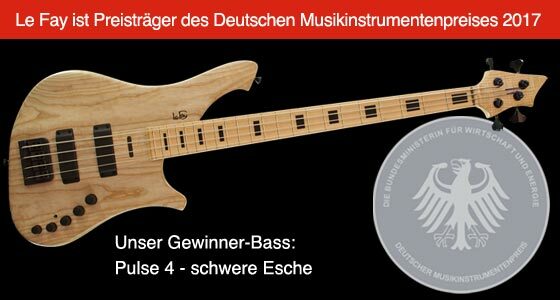 Marleaux Bassguitars and Le Fay are the winners of the German Musical Instrument Award 2017, sponsored by the Federal Ministry for Economic Affairs and Energy, in the e- bass category. The criteria for the submissions were: bass guitar, solid body, 4-string, two humbuckers, active electronics, and fretted fingerboard. 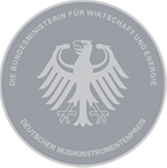 The submissions were judged in three evaluation processes: a “subjective assessment” by 5 renowned musicians, an “objective assessment” based on metrological tests carried out in a laboratory, and an “artisan assessment” performed by a master craftsman appointed by the advisory board of the German Musical Instrument Award. The instrument we submitted was a Pulse 4 with an ash body and maple neck. We are overjoyed that our Pulse was able to convince the jury. In April we’re travelling to Frankfurt in our new suits to receive our award at a ceremony at the Musikmesse trade show. We’re sure to pay a visit to our Pulse, since it’s being exhibited as an “award- winning instrument” at Frankfurt’s Musikmesse for the duration of the trade show. We see the award as recognition of our efforts to comprise high-tech, an innovative spirit, our love for details, craftsmanship and the consistent coherence of wood, magnet and metal in our instruments. The award motivates us to stay true to our philosophy, and to always get up really early to make sure we manage to do all that. We wish to thank the jury members of the German Musical Instrument Award 2017, the IfM Institute of Musical Instrument Makers e.V. and the Federal Ministry for Economic Affairs and Energy. We wish to thank all the courageous individuals such as Ulrich Teuffel, Dirk Groll, Alex Zachow from Troyan Drums, and our friends at EGB, who are pursuing the same madness as us and who support us with advice, encouragement, communication, friendship and solidarity. We wish to thank our valued customers who put their trust in us and thus enable the continued existence of Le Fay. We wish to thank all the bass players who we’ve become friends with over the years, and whose feedback, advice and input has given us great encouragement.